One good thing about posting old news stories is finding obscure reminiscenses of people who were eye-witness to historical events. If you're an Abe Lincoln buff, you might be interested in some of the memories of one of Lincoln's personal friends, Vintage Kansas Cityan Col. L. H. Waters. 100 years ago last night Col. Waters shared some anecdotes about the martyred president at a Lincoln Centennial memorial held at KC's Manual Training School. 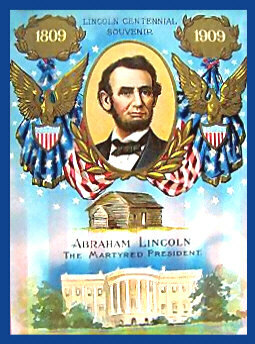 A few months earlier, the Colonel gave more insight about Abraham Lincoln, the laywer. In May of '08 (1908) a Kansas doctor, Dr. T. D. Bancroft, wowed audiences at the Grand Avenue Methodist Church with his first-hand account of the assassination of Abraham Lincoln. He was there at the Ford Theatre, holding back the crowds, and even managed to garner a piece of paper with the slain president's blood on it which, 100 years ago, resided at the State Historical Society in Topeka. I wonder if they still have it. I didn't see anything about it on their website. I'll make a pilgrimage out there this Spring and find out. They might not even know they have it there.